Buy through MusicWeb for £12.49postage paid World-wide. Since his death Berio’s music has not faded from the limelight. 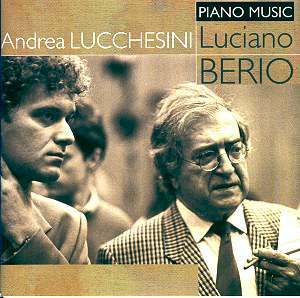 Several discs have emerged of late but this one is of especial interest because of Andrea Lucchesini’s connection with the composer. Lucchesini is pictured with the composer on the CD cover and inside the booklet. He worked regularly with him and played the sonata in the composer’s presence. The work which is especially pertinent here is Berio’s only Piano Sonata. This receives extensive coverage in the booklet with an essay by the performer another by the dedicatee Reinhold Brinckman. There’s also a brief note by Berio himself as well as a very useful essay by David Osmond Smith. Smith has written about Berio and is an expert on 20th Century Italian music. In his essay Smith outlines Berio’s expertise as regards piano music and also includes a very readable description of the music. The Sonata, Berio's last piano work and one of his very last works, opens the disc. That said, I would like to consider the works in chronological order beginning with the Webernesque ‘Cinque Variazioni’. In this work there are moments of great stillness and moments of sudden, indeed violent and wild, movement. Some variations are short and fast, others slow and reflective. You may be reminded of the Boulez sonatas here: certainly the typical pointillistic sound-world of the 1950s and 1960s. The final effect is however rather cerebral. Sequenza IV is one of a famous series Berio composed for solo instruments. This explores the keyboard more fully than the earlier pieces. It also experiments with various articulations for example it begins with pianissimo staccato chords, suddenly juxtaposed with faster passages and strong staccato dissonances. Things continue apace in a deliberately virtuosic display. However light touches are needed in toccata-like passages as well as patience to allow the sounds to ‘speak’ into a following silence. Note also the colourful tremolandi passages emphasizing a single pitch with cascades of notes on either side. From there one might move on to ‘Rounds’ of 1967, still very much of its time, and investigating a similar sound-world. Again the writing is jagged with sharp, loudly-accented chords then stillness, and punctuated by silence. I was reminded of Stockhausen’s ‘Klavierstücke’. The effect is playful and full of surprises. One single pitch is heard more than any other, a technique developed later in the Sonata. The ‘Six Encores’ were written over a 26 year period but are curiously related. None of them jar against each other. I suspect that Berio would have been happy to have these aphoristic pieces played singly as one-off encores. One is called ‘leaf’. The rest have German titles like ‘Fauerklaver’, which is a sort of ‘perpetuum mobile’ of high virtuosity; it would make a brilliant end to a programme. Andrea Lucchesini was a friend of the composer and worked closely with him on a piano concerto ‘Echoing Curves’. As a result of a series of brilliant performances Berio wrote for him the two miniatures ‘Touch’ and ‘Canzonetta’ each for two pianists. Here he is joined by his wife Valentina. The pieces were wedding presents and are absolutely delightful - light and crepuscular. So finally to the Sonata, the work which opens the disc and the longest one in the collection. The note B flat is the still centre around which the entire twenty-three minutes oscillates. At first, not much happens and when it does it’s very quiet. Twenty minutes later all hell has broken loose in cascades of notes, showering the entire instrument. The gradually built up tension has been released. The genius of this piece is not only how it holds your attention, but also how it sustains a single concept over its extensive span. In this work, as in all of them, Lucchesini is totally in command. Although I believe another disc of the piano music has emerged (Francesco Schlime, Sisyphe) Philip Clark (Gramophone) seems in little doubt that it cannot equal Lucchesini’s "keen ear for the culminating structure" of the sonata. It’s good to know that Berio is well served by performers and recording companies at a time when, soon after death, any composer can be overlooked and in some cases remain forgotten. What we need next are some more recordings of the chamber music - perfect for this very enterprising and laudable Avie label.